I finally have the internet back! Oh it feels good. Now I can get back to doing what I love- shilling stuff I've done! 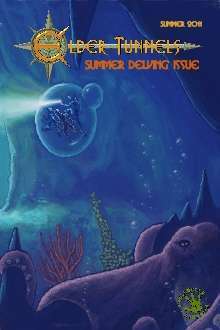 Elder Tunnels, Peryton Publishing's quarterly Tunnels and Trolls adventure collection, has returned with its summer/fall edition. The new book contains three adventures, two GM and one solo scenario, by Tom K. Loney, Trevor Hudgins and myself. My own contribution is a GM adventure called Fast Food, which tells the tale of a burger joint that isn't everything it seems - trust me. If you want to buy the latest Elder Tunnels you can find it at DrivethruRPG for a rather small price.